A bad witch's blog: Sussex Folklore: A Twin to the Wishing Face? Sussex Folklore: A Twin to the Wishing Face? Many years ago I went on a quest to find the Wishing Face - a little goblin’s head set into a flint wall opposite a St Margaret's Church in the village of Rottingdean, Sussex. You can see it in the photo at the top of this post. According to folklore, if you rub his nose and make a wish it will come true. I originally learnt about the Wishing Face from the book Where Witchcraft Lives by Doreen Valiente. Then last week, quite by chance, I think I found the Wishing Face’s twin – in the Battle Museum of Local History. In one of the cabinets was the little head pictured right. The label said it was an unidentified small face in clay, but I think it is so similar to the one in Rottingdean that it might have been made at around the same time – maybe even by the same artist. According to Doreen's book, the date "1306" used to be inscribed in the cement under the Wishing Face, but that wasn’t there any more when I visited in 2010. Also, his name seemed to have changed from the Wishing Face to the Wishing Stone in a description at the church. 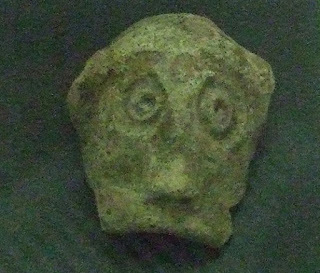 I wonder if there are more little clay goblin faces to be found in Sussex? You can view Where Witchcraft Lives on Amazon. Awesome, it would be interesting to start a nationwide search and see if anyone can spot any in their local communities or museums and see if they are spread further than we realie! I am sure Britain is full of green man carvings, and some more reknown than others! I'm not sure that it is a green man, as there isn't any foliage. I'm not really sure how you would classify it.